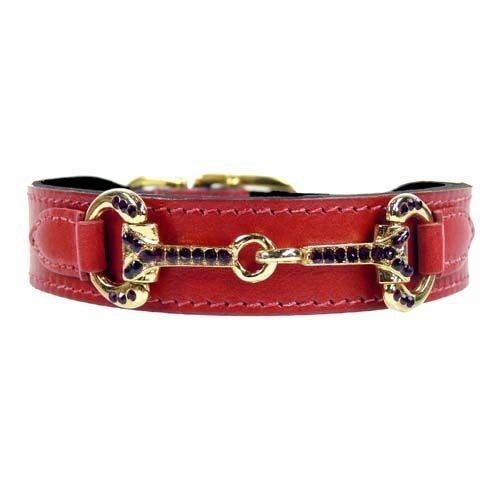 A beautiful classic Ferrari red leather dog collar, handmade, with original Swarovski crystals and polished with with 22 carat gold plate. A breathtaking Ferrari red leather dog collar, that is made entirely by hand from 100% Italian leather. The collar is magnificently decorated with a decoration in the shape of a horse bit, which is polished with 22 carat gold plate and is trimmed with original red Swarovski crystals. This collar is a highlight in the collection of Hartman & Rose, which has already drawn worldwide attention. The beautiful dog collar is lined with soft Italian leather, so the collar for your dog will be comfortable sitting. The batter is also plated with 22 carat gold.